I included pieces of real shells too. The word "Christmas" is a Quietfire Design stamp and the rest is my lettering. Click on card to see details and descriptions etc. Enjoy. Your coloring are gorgeous, fantastic job. Thanks for playing at OSAAT. Hugs, Nataliya. Oh i love the background. Holly on a beach umberella looks my type of christmas. I really dont like the cold. Thankyou for sharing your card with us at OSAAT for the digi madness challenge. Such an unusual Christmas card, and it's gorgeous too! Brilliant card Yogi, thanks for joining us at Delightful Challenges. This is a fabulous card Yogi! I so enjoyed emailing with you as we talked about this image. It is great to get to know people and create friendships through this craft that I love. Thanks for joining us for our TTThursday Challenge. What a fun twist!! Thanks for joining us at S2G. Be sure you join us again for next Thursday's Challenge! Great card, lovely image would never have thought of doing a beach scene for Christmas but it worked and your colouring is great. Thanks for joining in the fun with us at CCT this week. I love the originality of your card Yogi, it's very appealing. The colours are great and the scene is beautiful. Thanks for taking part in our digi madness challenge at OSAAT. So clever! Thank you for joining us for Twisted Thursday at Shirleys2Girls this week. Join us at SNR for some fun on Thursday night! What a great card. I love how you have colored the images. Very artistic! Thank you for joining us at Cute Card Thursday! Good Luck! Wonderful card! Fabulous colouring and layout and I love the idea!!! Thanks for playing at Stamp Something, hope to see you back next week! Great colours and lovely image! Thanks for joining us at OSAAT this week for our digi madness challenge. a fabulous festive card! thanks for joining in with us at CCT. Beautiful card, love the coloring! thanks for playing at S2G! Beautiful card! Thank you for joining us at One Stitch at a Time this week. 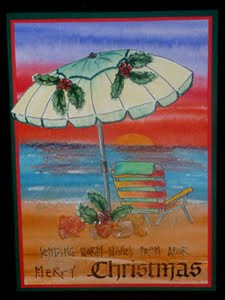 Another fabulous card Yogi, who wouldn't love to spend Christmas on a sunny beach! (Just once would be nice!) Thank you for joining OSAAT's Digi madness challenge this week! !